Recently, we were asked to review By Nature's Grain Free Chicken and Potato flavor dry dog food. "By Nature is a small, family-owned company that makes high-quality foods and treats for pets. They are rooted in the tradition of the family farm and live up to their 140-year heritage of providing diets of the highest quality, using only ingredients that deliver the best nutritional benefits to your pet." So being the professional taste tester of the family I agreed, it's a tough job but someone's got to do it! First I did my "look test", because we all know our eyes are the windows to our tummies! Then the "smell test", because my nose is almost superior to my mouth. And finally my favorite the "taste test", because my taste buds don't lie! Of course they all passed with flying colors! As you can see they are a perfect size for me and for any size dog. They tasted great, mom knows because I kept eating the pile of food before she could snap a picture. Ingredients: Chicken Meal, Potato Meal, Chicken Fat (Stabilized with Mixed Tocopherols), Flaxseed Meal, Dried Egg Product, Sweet Potato Meal, Alfalfa Meal, Tomato Pomace, Natural Chicken Flavor, Salmon, Yeast Culture, Potassium Chloride, Salt, L-Lysine Monohydrochloride, Dried Carrots, Dried Chicory Root, Vitamin E Supplement, Choline Chloride, Zinc Sulfate, Zinc Proteinate, Vitamin A Supplement, Vitamin D3 Supplement, Blueberries, Cranberries, Turmeric, Raspberries, Ginger, Niacin Supplement, Ferrous Sulfate, Manganese Sulfate, d-Calcium Pantothenate, Manganese Proteinate, Copper Proteinate, Thiamine Mononitrate, Copper Sulfate, Vitamin B12 Supplement, Herring Oil, Riboflavin Supplement, Pyridoxine Hydrochloride, L-Ascorbyl-2-Polyphosphate, Betaine, Calcium Iodate, Folic Acid, Biotin, Selenium Yeast. By Nature Pet Foods are available at select pet stores as well as online, go here to find a retailer. Connect with By Nature through their Website, and on Facebook and Twitter. 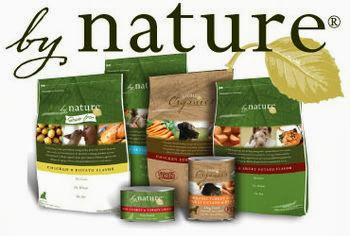 By Nature Pet Foods has been so kind to offer my readers a chance to win one of 3 bags of dog food to try for yourself. Just enter the giveaway using the rafflecopter form below. The giveaway is open to U.S. residents and ends on 10/8 at 11:59pm EST. Three winners will be chosen at random and will be contacted via email. Disclaimer: We received this bag of dog food from By Nature Pet Foods for a review. Like all reviews on this blog, our thoughts and comments about the product are our own. Have a terrific tasty Tuesday and don't include us in the give-away as.we across the pond. BOL,, You keep eating the food before your mom can get a photo. It must be good fur sure. Thank you fur the chance to win. I have eight dogs, three of which are rescues who would all really like To do their own see/smell/taste test of this by nature food. I use only natural made in the USA products so this food would be perfect for my fur kids, especially since the food we were using has been recently discontinued from our local store which means we are ordering online until we find another food to use, since this food is available at our local pet store, it would be perfect, so we would love to win to try out a bag and if they like it as much as Miley did, we would make the switch! Thanks for the chance to win! Thank you for providing nice information about highest quality of dog food. And also provide the ingredient list. Nice Photo. Providing diets of the highest quality ingredients that deliver the best nutritional benefits to your dog.Thank you for sharing this information.